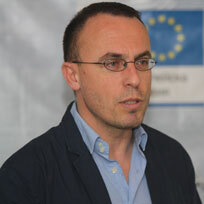 Ivan Nachev is a Bulgarian political scientist, an expert on the political integration of the European Union. He holds a degree in political science from the Faculty of Philosophy at Sofia University “St. Kliment Ohridski”. His diploma thesis is in the field of constitutional foundation-laying and regulation of political life. He also holds a degree in cultural studies. He specializes in European integration at the Centre for European Studies and at the Centre for the Study of European Governance at Nottingham University, Great Britain. His doctoral dissertation is in the field of the political integration of the Republic of Bulgaria in the European Union. Since 1993 he has taught at New Bulgarian University. His research interests are in the field of political theory and practice, European integration theories, strategies and political practices. Chief Assist. Prof. Ivan Nachev is an expert in the field of the political integration of the European Union, in the issues of the free movement of people within the European Union and the integration of Bulgaria in the European Union; he is a consultant on the processes of absorption of the Instruments for Pre-accession Assistance and the absorption of funds under the Operational Programmes of the Republic of Bulgaria. He has held the position of Director of the “Bulgarian Observer” magazine – the only magazine in Bulgaria for political analysis and prognosis. He is a member of the Bulgarian Association for Political Sciences, the Institute for Public Policies and Partnership, the European Community Studies Association (ECSA) and Team Europe at the European Commission. Ivan Nachev has a number of publications in the field of the political integration of the European Union, the study of the political elite and the development of creative economies of the members states of the EU, in Bulgarian, English, French and Turkish.